Irish artist Deirdre McLoughlin is a graduate from Trinity College Dublin. Moving to Amsterdam in the early 1970’s she began working in clay inspired by the sculptures of Rosemary Andrews. Finding form in this medium she would eventually come to the realization that the shapes she was making were a language of expression and were what was generally termed art. Up until then she was unable to answer the continuing question, ‘why do you not make something useful’. The realization brought her to Japan where she set up studio and worked alongside the artists of the Sodeisha Group. 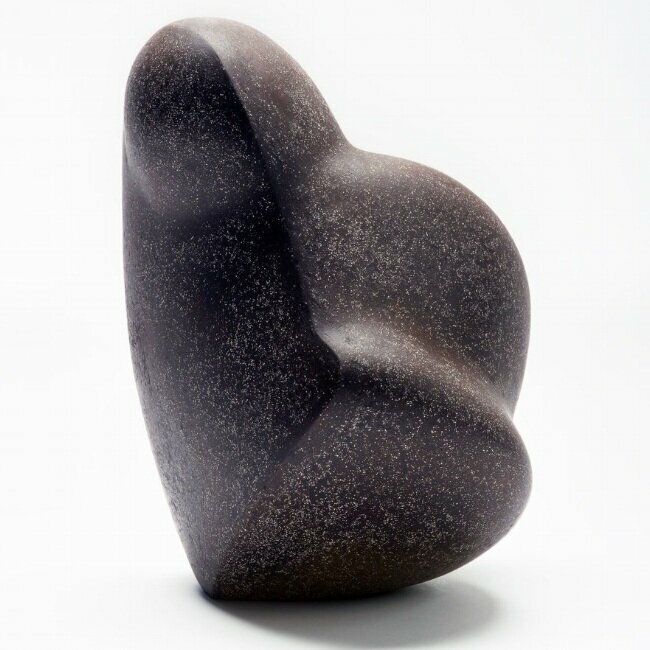 The sculptures of Yasuo Hayashi, in their sublime geometry, have had a lasting influence on her. After her first solo exhibition in Kyoto she travelled throughout China, which was opening up. In 1988 she returned to Amsterdam where she now based. The archetypal form, the ovoid, remains central in Deirdre McLoughlin’s work. Imbued with an intense physicality and dedication to perfection of form and surface, her sculptures are layered with meaning, charged with movement, a feeling of power, a sense of purity. Her making process is slow and demanding - she describes it as follows. "The works are coiled with a building and breaking movement over days into weeks, concentrated and chaotic by turn till in an instant the work seems right, seems to have its own logic.” Then she begins the process of polishing and grinding through multiple firings. Deirdre McLoughlin is twice winner in Keramik Europas Westerwaldpreis and honoured in Kocef, Korea. Her portrait is part of the National Self Portrait Collection of Ireland and her work has been honoured with a stamp. She is an elected member of the International Academy of Ceramics. She works full time in her studio and exhibits internationally.